Has Fermilab really discovered an entirely new subatomic particle? And could this change the universe? Yesterday, physicists announced the discovery of a strange anomaly, one that cannot easily be explained by our current understanding of particle physics. We examine what's really going on here, and why we all may have missed the really exciting discovery. What's the background for this result? The experiment in question involved Fermilab's Tevatron collider together billions of protons and antiprotons. Since these collisions happen at very high velocities, a lot of energy is created in the aftermath of the collision, which in turn can briefly create massive subatomic particles that don't generally exist in the everyday world. These particles then, in turn, decay into less massive, more stable particles, and these can then be analyzed to figure out what the heavier particles were. 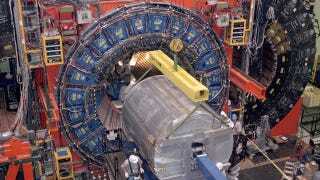 In this part of the experiment, the researchers were looking for collisions that created the W boson, a particle about 87 times the mass of a proton, as well as sprays of particles known as jets. These jets are the result of free quarks being created, which then very quickly combine with other quarks or antiquarks to form composite particles, which spread out in these energetic cones. For more background on quarks and W bosons, you can check out our primer, but that's enough for our purposes here. So what did this particular experiment find? The crucial point here is that you can determine the various particles created in these collisions by looking at the energy of the jets. We can also use the Standard Model to predict the expected values created in these events. Unless something seriously weird is happening, the expected and observed sets of data should more or less sync up. At a collision energy of 150 GeV, something seriously weird happened. As you can see in this figure from the researchers' paper, there's a big blue bump where the data registers way more events than expected at that energy level. According to project spokesperson Giovanni Punzi, there were around 253 more electrons and muons created than expected compared to a background of about 10,000 such particles. Such jets could be created by a previously unknown particle about 160 times the mass of a proton, although we stress that's only one possibility. How unusual is this result? Well, the researchers say this effect is 3.2 standard deviations from the expected norm, which is definitely an interesting result, but not nearly strong enough to constitute immediate proof of something as dramatic as a new particle. There's only thought to be a 0.076% chance that this result is a fluke...but even that isn't considered compelling. Indeed, plenty of anomalies that turned out to have perfectly ordinary explanations had far lower odds than that, so we definitely need to be cautious about all of this. 1. It's just a fluke. Even if there really is just a 1 in 1300 chance that this is the case, this is the possibility that's most in line with accepted physics. As such, we definitely shouldn't be in a hurry to discount this, even if it's the least exciting possibility. 3. This is an unexpected, previously unknown feature of the Standard Model. This means we're not invoking any new features of the universe, but instead saying that the particles and forces we're familiar with might sometimes interact in unexpected ways under certain, very specific situations. 4. This really is a previously undiscovered particle. If there really is an unknown particle about 160 times the mass of a proton, then it's done a phenomenally good job hiding for so long. It would need to have some highly unusual properties to help it escape detection - for instance, it apparently shares the W boson's ability to decay into two jets, but its decay must otherwise be very different, or we would have found it ages ago. And if this is a new particle, physicists are already in general agreement that it isn't the long sought Higgs boson, as it's far heavier than the Higgs should be, and its decay pattern doesn't match what physicists expect from the Higgs. 5. This is a new fundamental force. This is probably the least likely possibility. After all, there are only four fundamental forces as it stands: gravity, electromagnetism, and the strong and weak nuclear forces. The idea is that this force would only operate over very short distances, like those within an atomic nucleus. While this discounted - it's also possible that this mystery particle is a carrier of some new force in the same way the W boson is a carrier of the weak force - this would really shake particle physics to its core, and so this idea demands the most evidence and the most skepticism. Whatever is going on here, it's important to remember that this doesn't mean the Standard Model is wrong - this won't overturn the decades of careful investigation and experimentation that have revealed the various elementary particles that make up the universe. What this might mean - heavy emphasis on "might" - is that the Standard Model is incomplete, but physicists pretty much knew that already. This could just be some of the first really tangible proof of that. This particular experiment was conducted by Tevatron's CDF (Collider Detector at Fermilab), one of the two experimental collaborations using the particle accelerator. There's a second experiment located at another part of the Tevatron apparatus, which is the DØ (or DZero) experiment. "We understand that everybody is looking to us. We hope that within a few weeks you'll be hearing from us." If DZero can detect the same energy bump that CDF has, then that greatly bolsters the possibility that we're seeing something new, maybe even a new particle. However, if it finds nothing, then it becomes more likely that this is just an artifact of how CDF analyzes energy jets. Is this the only unusual discovery that Fermilab has made? Strangely enough, no. Lost in the sudden media interest regarding this mysterious energy bump is another, potentially even more intriguing hint of a new particle. Another recently CDF study, whose results were first published in 2008, discovered some odd behavior among top quarks in proton-antiproton collisions. Basically, at energies above 450 GeV, about 9% of the top quarks created in these collisions are expected to travel along the path of the electron beam. Instead, a whopping 45% of the top quarks headed off in the direction of the proton beam. That may seem like a huge discrepancy, but the chances that this is just a fluke aren't actually that much smaller than the 0.076% chance that the energy bump is a fluke - for the top quarks, there's a 0.04% chance that this is a coincidence. More encouragingly, there's now some supporting evidence for this asymmetry from the DZero Experiment. If the result holds up - and CDF co-spokesperson Robert Roser considers this one more likely to than the energy bump - then it would point to a new elementary particle that is itself a messenger for a new force, one that somehow interacts with the top quarks to create this asymmetry. The particle appears to be slightly too massive for the Tevatron to create, but the more powerful Large Hadron Collider should be able to observe it directly. How excited should I be about all this? "Nobody knows what this is. If it is real, it would be the most significant discovery in physics in half a century." "I'm kind of surprised that [The New York Times] wrote about it; it must have been a slow news day." So then, this is somewhere between totally earth-shattering and a complete non-story. Honestly, we're probably not going to know the full significance of this story for a little while, although the DZero results will hopefully help us get closer to the truth. If DZero can find corroborating evidence, then it might be time for the more powerful Large Hadron Collider to step in and search for this anomaly more directly. Until then, we can only recommend maintaining some healthy skepticism about all this. But then, that's almost always a good idea. Fermilab physicists about to announce the discovery of "a new force beyond what we know"